'Getting the most of the best to the greatest number number of people for the least': with these words, Charles and Ray Eames described one of their main goals as furniture designers. None of their other designs come as close to achieving this ideal as the Plastic Chairs. For years, the designer couple explored the fundamental idea of a one piece seat shell moulded to fit the contours of the human body. After experiments with plywood and sheet aluminium in the 1940s produce unsatisfactory results, their search for alternative materials led them to glass-fibre reinforced polyester resin. The Eameses recognised and fully exploited the advantages of the material: mouldability, rigidity, pleasant tactile qualities, suitability for industrial manufacturing methods. With this material, which was previously unknown in the furniture industry, they successfully developed the shell designs for serial production. The Eames Plastic Chairs also introduced a new furniture typology that has since become widespread: the multifunctional chair whose shell can be joined with a variety of different bases to serve diverse purposes. 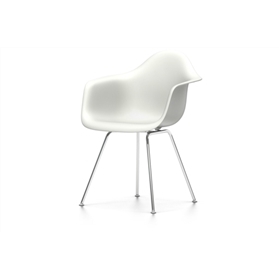 Today Vitra manufactures the comfortable seat shells of the the Plastic Side Chairs and Plastic Armchairs in polypropylene, offering a multitude of bases, shell colours and upholstery options. This allows customers to specify countless different combinations and to use the chairs in the widest range of settings - from dining rooms, living rooms and home offices to workspaces and conference rooms; from restaurants and cafes to break rooms and cafeterias; from waiting areas and auditoriums to terraces and gardens.